Science requires patience and patients. The former is much more easily attained, while the latter requires some convincing. If evil megalomaniacs have taught us anything, it's that violence is a great convincer. 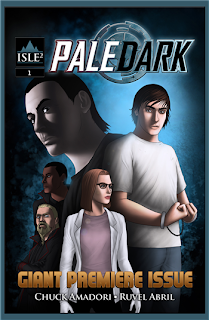 The Pale Man in Pale Dark #1 from Isle Squared Comics relies heavily on that tactic. The first issue is written by Chuck Amadori and illustrated by Ruvel Abril. Subject K is just that: a subject. He's at the whims of the Pale Man, a rather mysterious individual with nothing but sinister intentions and an army of powerful goons. K is necessary for some grander purpose, yet that purpose is left unexplained to him as the Pale Man tortures him incessantly. He's got support from some fellow inmates though, both of whom seem to want to get answers as much as he does. The story in the first issue opens with plenty of intrigue. Amadori drops the reader right in the middle of what appears to unfold into a vast plan that neither Subject K nor the reader is completely privy to. There's a lot going on behind the curtain and Amadori is definitely taking his time pulling it back, giving the reader bread crumbs as they read the first issue. The problem is that the bread crumbs are just that--crumbs. The plot moves almost too slowly to keep the reader engaged and curious as to what happens next. Little is mentioned about the Pale Man's past or what Subject K means to him. Instead, the story focuses on K being tortured for whatever reason, a doctor fearful for her safety and goons who do whatever the Pale Man asks. Abril's art is very dark (no pun intended), which is very effective at making the Pale Man stand out. The art style is very rigid; it's almost as if you're looking at cardboard cut-outs being staged for the various panels. There's not really an organic feel to the illustrations, which stunts the reading just a bit. Panel layouts are safe and standard, while the Pale Man appears to have only one expression (similar to many of the other characters in the work). The lettering is also extremely small and difficult to read, which probably isn't on Abril, but the dialogue bubbles appear to drown within the panels that are so much larger. Pale Dark #1 is supposed to be the start of what is a massive, 26-issue story that spans five graphic novels. If the pacing of the first issue is any indication, it's going to be very difficult to maintain any sort of pacing across so many issues, considering how slow the first one feels. That's not to say there isn't a great story to be had here. In fact, there's a lot of intrigue surrounding the Pale Man and Subject K. That story just needs to be revealed a little more quickly and with more detail in order to keep the readers coming back for future issues. It might be a book that you're better off waiting for the graphic novel collections to come out, as they'll give you a lot more to sink your teeth into. Pale Dark #1 is available now. I have to say that I completely disagree. I have had the great fortune of reading through Pale Dark, Issue 1 for myself, and I feel you have completely missed the point. As a lover of mystery, I found the subtle details, dark elements, and “lack” of information to be exactly what the story needs, as strange as that may sound. I’ve never read a good mystery that gave away too much information in just the first chapter, and I relate that same element to the world of comic books. You must remember, there are many issues ahead, all which I’m sure will unveil a new piece of the puzzle and help to further fill in holes and gaps. That’s how a good storyteller does it. I personally find it to be a huge weakness on the part of any author who tries to incorporate mystery into their work yet gives away too much information up front when they’re attempting to keep people intrigued and wanting more. Perhaps this isn’t the kind of work that will appeal to the ADD generation that thrives on instant gratification. We all know that there are a lot of people who want things up front and fast, and I can’t fault them for that. This isn’t going to be everyone’s cup of tea. However, for those of us that are looking for a great, well-rounded sci-fi mystery that is well written and makes you work for the story rather than serving it to you on a platter, it’s well appreciated and a wonderful, incredible read. That’s who this comic is aimed at, and those are the people who will gravitate towards it and love it as much as I have. I honestly feel bad for those who won’t have the patience to let this story tell itself with each new issue. In the end, it’ll be their loss. That certainly won’t stop me from enjoying it, and for those who love a good story that makes your brain think, read the first issue and I think you’ll agree with me. Thank you for your kind words. I'm glad to see there's an audience that understands the mystery I am trying to build. There are so many answers coming in the next few issues. I'm not sure why some readers need everything spoiled right up front. I could see if this was a one shot, but it's part of a bigger story and trust me, there will be answers... and it will be an epic ride.